Chinatown has seen a revival over the past couple of years, with a flourish of new eateries that do more than just archetypal Dim-Sum and Cantonese-style Roast Duck. There’s Baozi Inn which has brought in good Sichuanese… Rasa Sayang that has brought in authentic Malaysian food from the Straits… and of course Leong’s Legends which has brought in some very decent Taiwanese cuisine (so popular they’ve even opened a second branch a few doors down from the original one on Macclesfield Street). The dark, L-shaped interior of the original Leong’s Legends isn’t very large at all – there are only about 12 to 15 rustic tables at most, separated by wooden beams in an attempt to recreate the old Chinese Cafes and Tea-houses of old. The limited space here results in a rapid, bustling turnover and the inevitable long queues that curl alongside the shopfront during the weekend lunch rush hour. Not this particular Easter weekend though… London did seem a little quieter than usual given the long bank holiday weekend, thus we managed to get a table for 3 on the spot. I come to Leong’s Legends when I’m craving one thing, and one thing alone – Siu Long Bao. These little treasures which are filled with minced pork and a deliciously fragrant broth are exactly the sort of soul food needed to fend off the cold, soggy start to Easter Friday which was brewing outside. The real challenge as always was gently lifting the dumplings off the bamboo basket without piercing the skin and losing all that wonderful soup filling inside. On their day, Leong’s Legends Siu Long Bao are in my mind amongst the best you will find in Chinatown – the soup inside the dumplings and sweetness from the minced meat is second to none… perfect when dipped into the strong black vinegar it is customarily served with. However on this occasion, despite the minced pork and broth being up to standards, we found the skin a little thicker relative to the last time we had it and dried out from over-steaming. Once the formalities of stuffing our faces with Siu Long Bao were over, we moved on to the various other Taiwanese Specialities we had ordered. 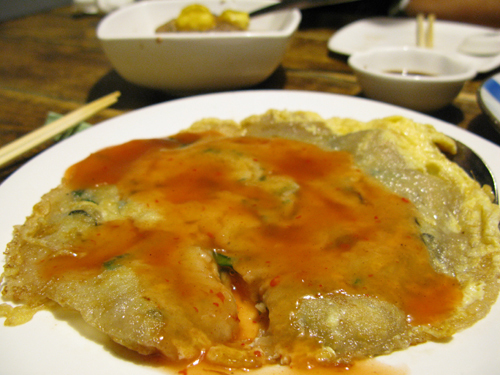 Oyster Omelette, a speciality originally from China’s Fujian province was a little starchy, but otherwise as you would expect – a wholesome eggy package stuffed with large, juicy oysters, vegetables and topped with a mild, sweet chilli sauce. Comfort food to the max and its no surprise its made its way from its roots in Southern China into the regional cuisines of Taiwan, Malaysia as well as other parts of South-East Asia. Another great dish they do here that is worth a mention is their Slow-Braised Belly Pork, another one of LL’s staples which I can’t resist from ordering every time I’m here. The belly cut is rich, meaty and melt-in-the-mouth tender from hours of slow cooking. Served with a generous helping of steamed white rice to accompany, its a meal in its own right, but one I’d recommend sharing with the rest of the table as its a little rich and heavy to finish alone. In addition to the much-craved staples, we were tempted by the pictures in the menu to test-drive the Steamed Pork Balls with Salted Egg. 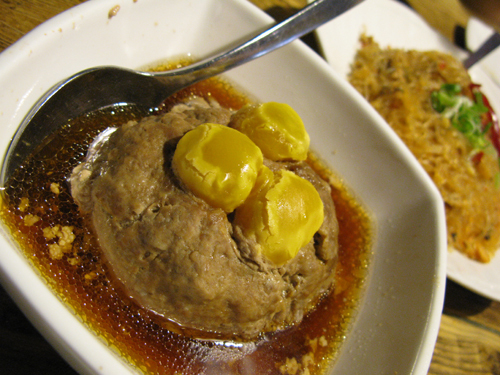 The egg yolks were wonderfully rich and savoury, but the dish was let down slightly by the Pork balls themselves which tasted a bit more liver-y than meaty. The Carbs we ordered didn’t blow our minds either. The porridge, despite generous lashings of Century Egg was a little bland and the Glass Noodles, despite a delicious crunch from the Crispy dried shrimp topping was undercooked and dry in the noodle department. There is a lot more on offer here at Leong’s Legends by way of Taiwanese specialities and more generic Dim Sum that I still haven’t managed to work through despite my 4 or 5 visits since it opened. 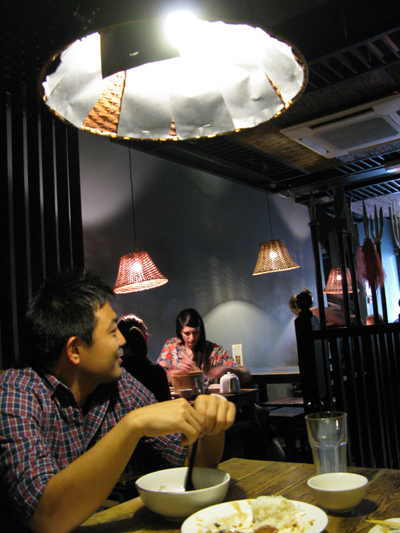 And at 10-15 quid a head, its still a great cheap-eat to load up on some very decent Taiwanese food. However, judging from this visit, I’ll continue to stick to the staples I love best and let my Siu Long Bao and Belly Pork cravings do the ordering. 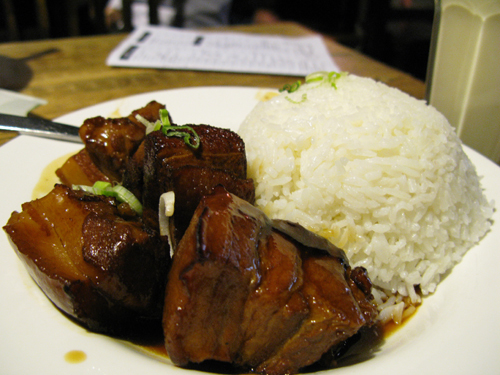 Oooh I haven’t tried their braised belly pork, will have to try it next time I’m there as it looks ridiculously good. Oo i think i’ve been here, the food is not bad actually, quite nice, but i think the service there needs improving, damn action one! Been there on a busy weekend lunch before and agree on the service. It was quiet over easter weekend tho, so no real complaints this time… How goes doctoring? 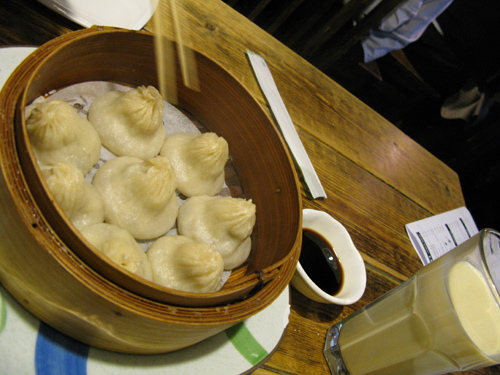 I thought that LL’s XLB were great, then I had some even better ones in Taipei and KL haha. But yeah probably the best around in London for now.